Dupuytren disease cripples millions of hands. We need a Dupuytren cure. There’s an obstacle. Most people have never heard of Dupuytren disease. Most government officials have never heard of Dupuytren disease. There’s no US government funding assigned specifically for Dupuytren disease research. I’m in Florida. 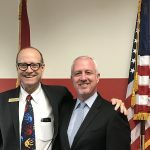 I contacted my elected Florida government officials. 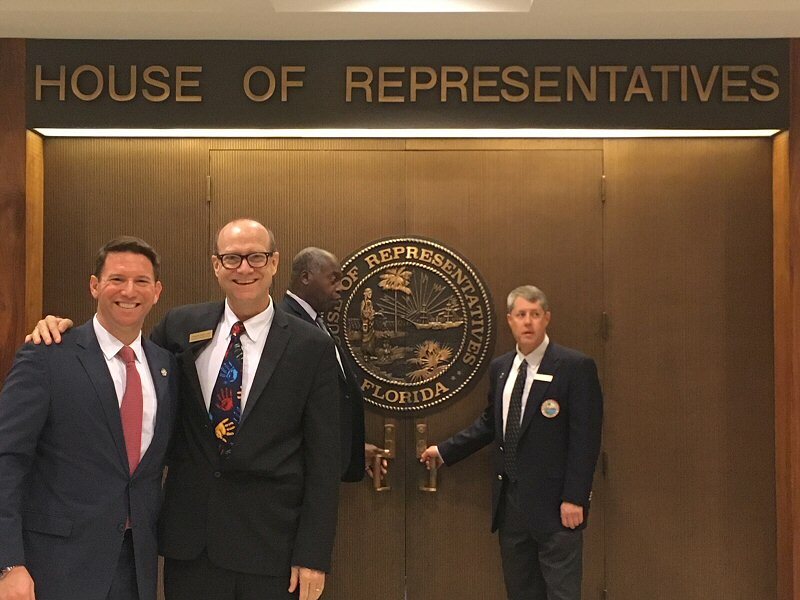 They are submitting a resolution to make April first Dupuytren Disease Awareness Day in Florida. 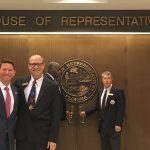 They’re happy to help because this disease crosses all party lines. 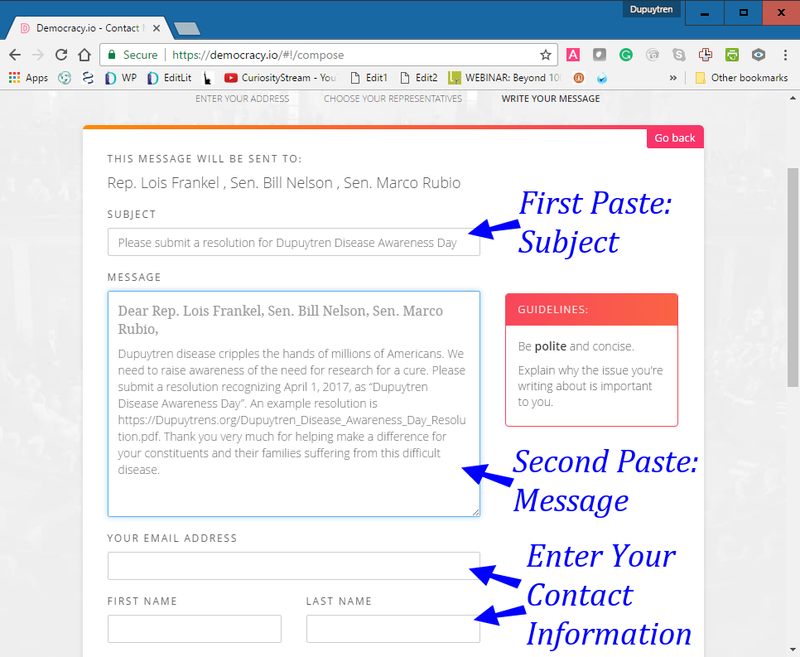 I’ve made it easy for you to do the same for your state government officials. 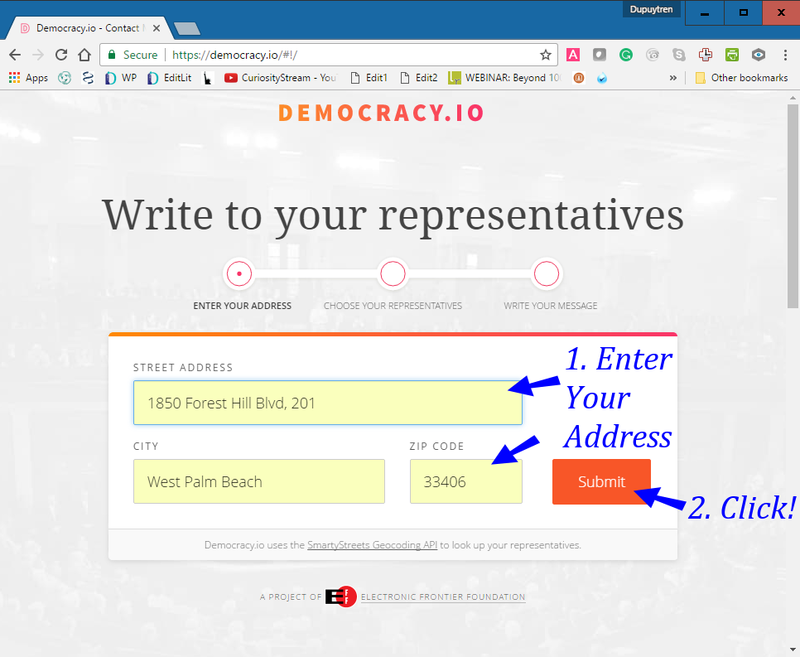 We’ll be using Democracy.io, a free secure site which makes it simple to email your state government officials. The link below will open Democracy.io in a new tab. 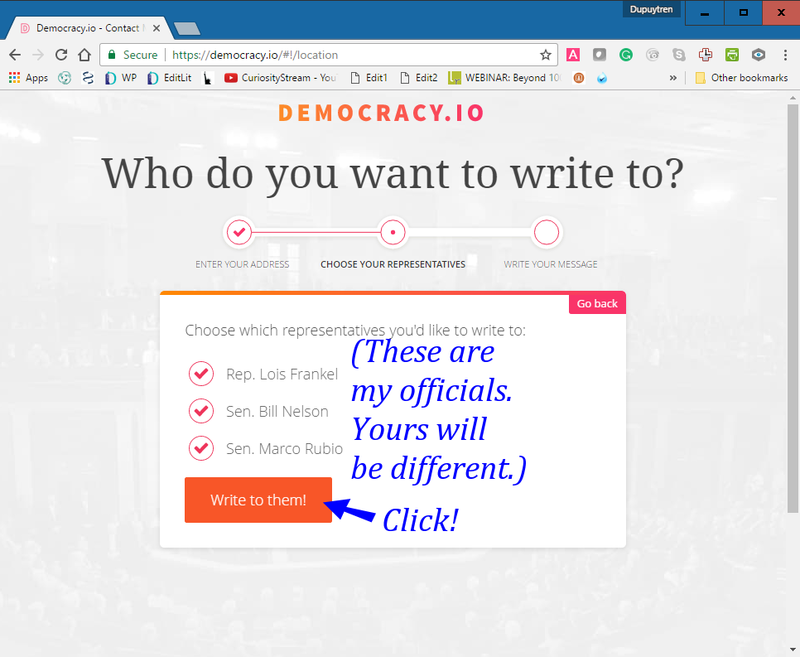 You’ll go back and forth between this tab and the Democracy.io tab to copy & paste two items from this page into the Democracy.io form. Here are the instructions to walk you through the process. They’re detailed, but you’ll see it’s pretty simple. Should take about two minutes. Come back to this tab. Copy the highlighted text (CTRL-C or CMD-C). Go back to the Democracy.io tab (the tab, not the blue button on this page). Click in the middle of the text box under “Subject”. Dupuytren disease cripples the hands of millions of Americans. We need to raise awareness of the need for research for a cure. Please submit a resolution recognizing April 1, 2017, as “Dupuytren Disease Awareness Day”. An example resolution is https://Dupuytrens.org/Dupuytren_Disease_Awareness_Day_Resolution.pdf. 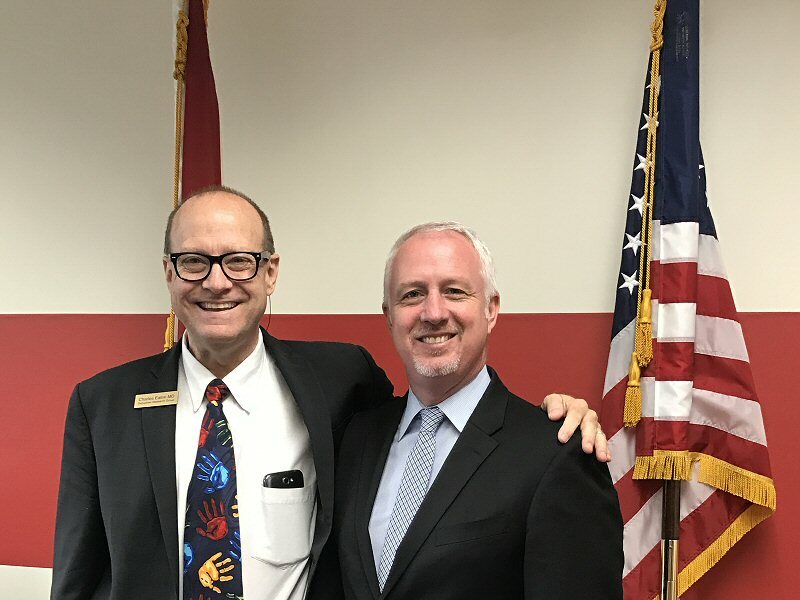 Thank you very much for helping make a difference for your constituents and their families suffering from this difficult disease. Copy the text (CTRL-C or CMD-C). Go back to the Democracy.io tab. You can personalize your letter with details about how Dupuytren disease has affected the lives of you, your family and your friends. Fill out the rest of the form. Choose “Health” or “Health Care” as Topics. I know what you’re thinking: “Wait a minute. April first? That’s April Fool’s day!” That’s right! We’re flipping it. Dupuytren’s disease has fooled too many people for too long. Don’t you think it’s time for us to turn things around? If enough states pick this up, we can push for a national Dupuytren Disease Awareness Day. This will raise awareness and help create government funding for Dupuytren research – one step closer to helping those suffering from this crippling condition. It’s simple. Five minutes, tops. Make a difference for yourself and for your family. Spread the word, because everyone needs to know about Dupuytren disease.